Nose: Whiskysoaked raisins. With water it develops sauna notes, a hint of smoke and after a while toffee. 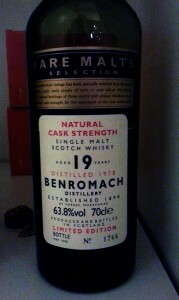 Palate: Sherry cask and wood chip. With water orange marmelade. Comments: Nice, but not exactly overwhelming. Nose: Malt and tobacco. With water I get more smoke, as well as lemon curd and digestive bisquits. Palate: Bonfire and malt. With water the tobacco shows up on the palate, but also lemon. Comments: Yummy. It’s funny how the smoke and tobacco exchange places nose/tastewise with water. Not complex enough to be worth several hundred pounds at auction, perhaps, but certainly moreish. Nose: Orange, melon and malt. With water green leaves and after a while in the glass suddenly intense butterscotch, then later again goat willow and lemon sherbet. Palate: Malt, wood, herbs, Bitter finish. With water it develops fruitiness with underlying moss. 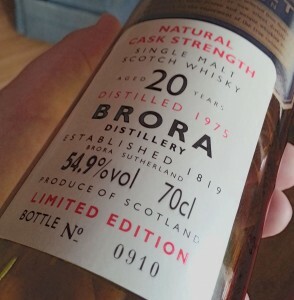 Comments: Very intriguing, a lot happens in the glass and I was told even more happened when the bottle was newly opened (I had one of a bout three drams left in the bottle for a month). 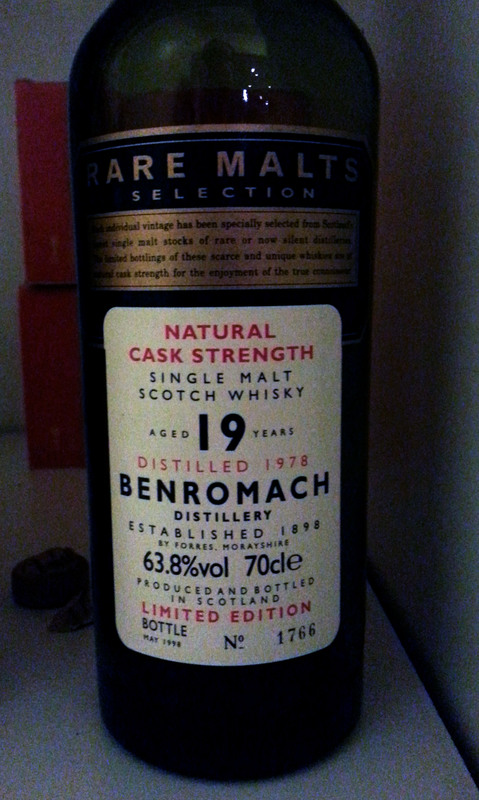 One of those Rare Malts I’d really like more of, because it’s interesting, but also very, very nice. Nose: Citrus, bonfire, a lot of alchohol. With quite a bit of water I get more fruits; melon and sweet pears. Palate: Cold smoke, lemon drops wrapped in waxed paper, oak. With water a warm spicyness develops, rather a lot of oaky bitterness and yeasty dough. Comments: This has been left as a dreg for too long, unless my memory of what it used to be like betrays me. 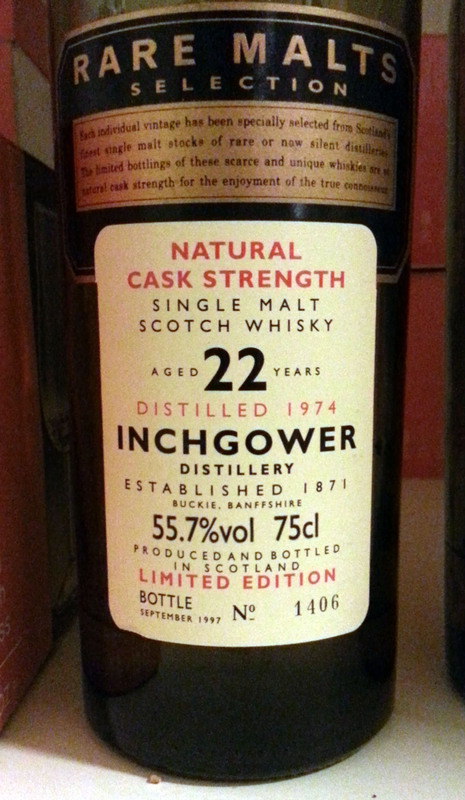 It needs quite a lot of water before it’s drinkable, and I guess it’s been matured in fairly inactive casks since the alchohol is still so obvious after 20 years. It has a lot going for it, but the bitterness on the palate is too overwhelming. I can’t remmeber it from before, so I suspect we must take this bottle as a sign that we really should have a spring clean (ok, a summer clean) in our whisky cabinet to make sure any dregs we want to keep are rebottled into sample bottles to minimise oxidation. Nose: Dried fruits (apricots, cranberries), acetone and wood varnish, banana, vanilla and rosemary. Obvious alchohol at full strength. 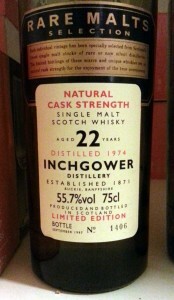 Water tones down the alchohol and brings out pine needles and menthol, milk chocolate and black pepper. Palate: Menthol, acetone, dried apricots and ginger. With water I also get dried banana, a little oak and sauna – as well as orange peel on the finish. Comments: It just doesn’t get much better than this. You could spend hours picking through the nose and flavour on this one. 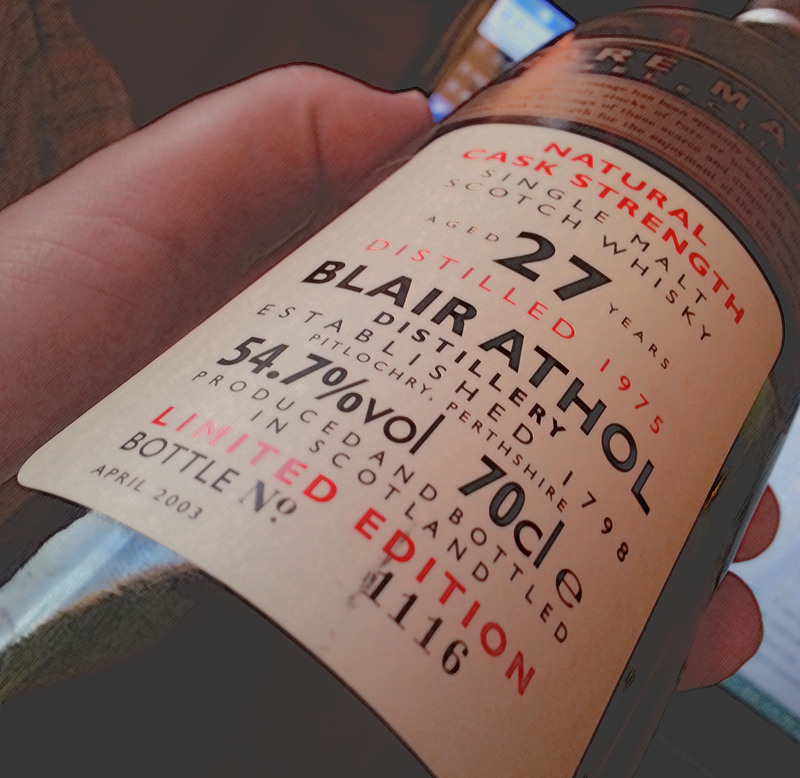 It demonstrates just why Rare Malts used to have such an impeccable reputation (though the last couple of years of Rare Malt releases did not seem to live up to it). A very clever purchase, if I may say so myself (it was a birthday present for Arve quite a few years ago).